Resolution #2.. Ahem, more than a few days late. …. Resolution #3 Stop doing that. But back to #2. I am a Black Friday shopper. The few years I spent working in retail in college taught me that early in the morning on Black Friday is when the crazies come out. And if you are going to be one of them, you should scope out the stores the night before and figure out their plans. Stores with any consideration to their employees have things mosty figured out and set up by Tuesday night before Thanksgiving, Wednesday afternoon at the latest. No signs are up, but you can pretty much tell what is going to happen if you have the eye for it. (And working in retail for a few years, I have that eye.) Otherwise you end up as the guy who is leapfrogging over the old lady in front of him (not kidding… saw it happen) to get to the leather office chair for $19.99. And then when you get there you realize that there are more than 100 of them, more than enough for everyone. And they are really uncomfortable. And this is why you should do some scoping. So you aren’t that idiot. But I digress. On Black Friday morning I went shopping. To one store. I went to my local RobertsCrafts. Oh how I wish Hobby Lobby wasn’t 45 minutes away. Moving On. They had some crazy good deals, and some all day sales, and some this-sale-lasts-for-two-hours deals. I ended up spending way too much money on craft supplies. And then the next day I went back (twice) to take advantage of more awesomeness. I bought Cricut cartridges (but I only buy them on this sale, so I totally justified it) and I bought paints in 30 colors, and felt in 13 colors and a lot of scrapbook paper, and a ribbon organizer, and sheet protectors and the list goes on. But, Saturday evening as I looked over my loot, and tried to figure out how it was going to fit into my craft closet, I came to this resolution. And now that I have lived with it for almost two months already… I figure it is safe to declare in blogland. Now, doesn't that just make your heart go pitty pat? Mine is pitty-patting! Might I also specify that my self imposed craft supply boycott also does not include sewing supplies. In my world crafting and sewing are different. Fabric, thread and patterns are not included…. this year. But, to appease the closet gods, I can’t buy something unless it fits in this already full closet, in it’s correct spot. That means I need to start working on all those sewing projects that are flitting about my head. (And in my mind I am thinking, yeah, so I can fill up those little empty spaces with more fabric…. that is exactly the mindset that got me here in the first place. Sigh.) So to help with that, I am going to try and join in the Sew&Tell group every week that Amy is hosting. My first project of 2010 is due Friday, which is practically tomorrow…. so I better get cracking. I realize, not exactly a clear cut one line resolution. And for me they never are. I always have to talk my way through them and hash them out. Still, it is one. Good luck! I’m sure you can do it, that’s a great lookin’ stash! Way to go with the new years resolutions! If you are out of something – just come ask me . . . I may have a small supply. I didn’t get rid of everything and maybe my one box of stuff will hold a special item for you!!! And WAY to GO on the sugar thing! Couldn’t do it myself right now, but maybe when I am done nursing and burning the extra 500 calories by doing nothing but feeding my little one, I will join you! I will not bring goodies over to your house in my lame efforts to complete my visiting teaching, I will bring you goodies of another nature (now I have to be creative, great, not a strong trait for me, but its good to try). We must play soon. I think I might have an ear infection, so not right now, but soon!! Oh, and I’m curious about your box of cars in the photo…? When I was young(er), like from age 8 to about 20, I collected VW bugs. That box holds my collection of about 50 cars from all over the US and a few from the rest of the world, plus newspaper articles, T-shirts, and postcards of my dear bug. It’s not exactly a crafty supply, but because of the shape of the closet, I have to pull out EVERYthing to get to those drawers on the far right. So, those four aren’t technically craft supplies, just things that don’t fit anywhere else in our house that I can’t bear to get rid of. Of course, if it came down to it I am sure I could make room for more craftiness in here. Which is a great source of comfort to me. I think I could sit and stare at that picture all day long! Definitely makes my heart go pitty pat. Love it! Wanna come organize my loft? For realsies? Sniff, sniff. Your craft closet is making mr teary eyed out of admiration. Its beautiful! Thanks Spicy! I rather like it myself. I gives me warm fuzzies inside. Oh my. I am in LOVE with your craft closet! The supplies – the organization – they’re all fantastic!! Good luck with your resolution. I’m sure you can do it! Wow. Seriously. Wow. I am salivating over your closet. 🙂 It’s gorgeous! This post is what brought me to your site! 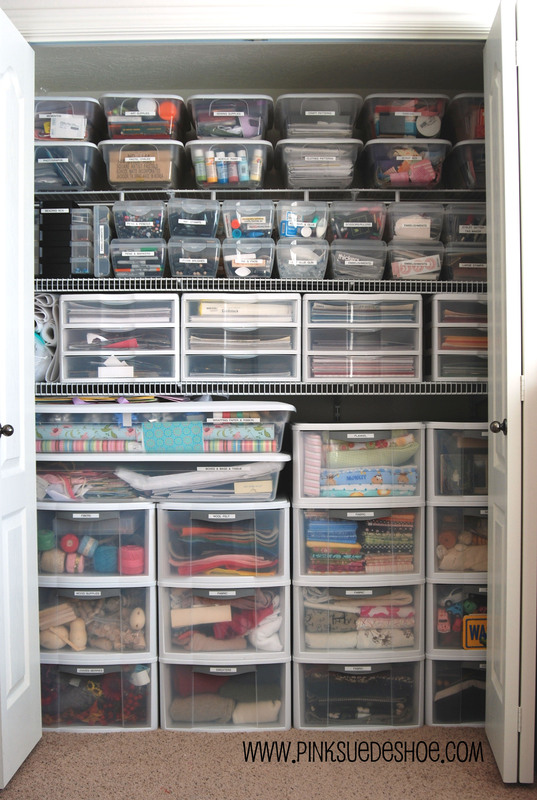 It inspired me to organize my families craft closet. Okay..so it’s not quite as organized but it’s getting there! I now have 2 of the rolling drawer carts with each drawer labeled. It’s pretty awesome to know where things are (and my kids love it!). I’ve just started a blog, called Home is Where my Heart is which you can find at http://cathhasablog.blogspot.com/. I’m pretty knew at this and am learning all the blogging etiquette, anyways, I would love to link to this post, would that be okay? I just want to say…again…how much I love your blog and how you have inspired me and I’m sure many more people. Thank you!! This is gorgeous! Where did you buy the 3-level drawer units, they’re exactly what I’m looking for!